Shopaholics on the alert! Get set, and go! Yes, it has indeed turned into a race – a race of online shopping. It may be an occasion embraced shopping carnival or a clearance sale or simply just a season ending mega sale. On its way is another such colossal online shopping fest knownas the Great Online Shopping Festival or simply GOSF which is to take place from the 10th to the 12th of December 2014. The GOSF is an initiative by Google and was launched on the 12th of December, 2012. Ever since then, it has been a favorite among its users. The GOSF offers are not only limited to those particular days of December but numerous trifle coupons, reminders as well as updates are also sent to your registered email ids all through the year. Along with these, there are funny little games on the GOSF site that provide you with innumerable opportunities to win yourself free gift coupons or free shopping facilities just by scoring points in the game. Worried about the products and their brands? Apart from the assurance of quality of the products and services, GOSF has lucrative offers via the coupons they provide. These coupons are easily available through magazines or simply, online. When added with the provided discounts, these coupons simply spice up your shopping experience, helping you to save your money as much as possible. Playing the Game to win a GOSF Arrangement: It has already started from this 25th of November and shall continue till the 4th of December. The game is very simple. You need to select the category (stationery, shoes, clothing etc) and remember four listed products. For availing the GOSF offers, you need to play this game that checks your clicking speed. Free Shopping of 14 minutes: 14 brands have agreed to partner up with GOSF and give away 14 minutes of free shopping to 14 lucky winners. You literally can shop till your pants drop and shop up to 2.5 lakh rupees. Exclusive Launching of brand new products: Products that have never been witnessed on the floors of India will be launched exclusively via GOSF from the 10th to 12th December. Another awesome offer only and only by the GOSF. Besides these major offers, you can also avail the COD or even free shipping facilities. So what exactly are you waiting for again? Register now and be the first in queue to avail all these exciting offers put on air by the GOSF. Owning a decent digital camera is the current craze all over the world. Surprising but true as most of the smartphones available today are fitted with powerful camera specifications which are popularly used for clicking images all the time. But a new trend of users interested in digital cameras is rapidly emerging across the world. The reason being they would like to try their hand at professional photography or at least shift from amateur photography to a slightly better photography with a professional touch. . Also with the increase in the interest of photography the digital camera prices in India have plummeted to a reasonable level. Moving on to the next level, you will find quality cameras with interchangeable lenses that promise a better performance than P&S cameras and even entry level DSLRs. Ideal for those pursuing photography and video shooting as a hoppy but would like to experiment with length and light. Most of these models are compact in size and offer manual as well as semi-automatic modes of use. Image quality is indeed to the next level while ideal for creative videos and for those who wish to venture into entry level commercial photography. The Pro dSLR range of cameras is one step above the prosumer range of cameras. These cameras are equipped with full-frame or APS-C sensor with interchangeable lenses, optical viewfinder with manual operation only. Pro dSLR range of cameras is ideal for photographers who wish to lay their hands on reliable and consistently performing cameras which can effectively capture action oriented images – birds in flight, sports actions and many more. GPS – Of course, it would be of great use to know the exact location of the captured image and this is possible through the in-built GPS receiver. Some mid-range dSLR cameras are equipped with this feature so do keep on a look out for them, if you wish to use it for your images. Through the GPS, you can tag photos with other important details such as time, date, landmark information and much more. But on the negative point, using GPS causes a drain on your battery power so be prepared for it. Wi-Fi – With enhanced internet connectivity across the globe and transfer of images and videos directly on the cloud storage or networked PCs or mobile devices, accessing them does become easy and greatly convenient. At the same time, you can upload them on photo sharing sites at a faster rate rather than transferring images on a PC and then upload them. Saves a great deal of time …. Right? Photography is an interesting hobby to pursue and if you are serious about it, there are many digital cameras you can begin with and upgrade to. But before you purchase them make sure you compare digital camera prices in India and click the best deal – money wise and feature wise too!! In today’s modern era, it’s all about technology. As a business owner, you need to tap into the potential of the Internet in order to expand your prospects. You’ll be able to reach more customers on a global level when you make your presence known on the web. It all begins with domain registration .ca. Add a great website and website hosting to the package and watch your company take off. Gone are the days when you only relied on brick and mortar business. In a fierce economy, you need to snag your customers any way possible. You want to grab their attention from the start and bring them back for more. Better yet, if your consumers start spreading the word about your business, even more interaction will come your way. With a catchy domain that is all your own and a first class website, you can make a big impression from the start. Choose a company that can help you get results. You might need a little help to give your website an edge over the competition. When you work with a company that specializes in web design and domain creation, your life will become much easier. See what the web can do for you. It’s time to make a splash and all it takes is choosing the right domain, getting your site up and running, and you’ll start to move up in the search rankings. Customers will be looking for you. When you need a new smartphone, it isn’t easy deciding which phone to pick and if you are not careful, you might end up paying extra for features you do not need. That is why it is advisable to compare mobile features and make an informed decision. nd Motorola Moto G. Keep in mind the design, display, performance, camera and battery while comparing these phones. You need to decide whether you want a small phone that fits easily in your pocket or you would rather prefer a big screen phone. The iPhone 5s is relatively small in size compared to the massive Lumia 1520. Getting a small size phone doesn’t guarantee it being lightweight, most often it is the opposite. 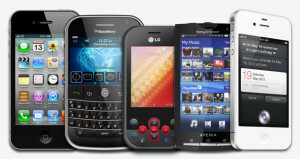 The smaller phone, most often is the heaviest. The Nexus 5 however, is small in size and lightweight. Phones often come in plastic or aluminum. However, there are exceptions such as the wood backed Moto X. The Galaxy Note 3 and Galaxy S5 have soft leather back panels. The Lumia 1520 looks best with its polycarbonate exterior which adds a premium look to the phone. There was a time when all smartphones were black but that trend is undergone change in the past few years offering customers much more variety with various colour options. If you want a brilliant gaming and viewing experience, you need a large screen display like in the Lumia 1520. Most smartphones will give you a resolution of 1080 pixels. The tap-on feature which wakes up the phone with a double tap on the screen is available in the LG G2 and there is a similar feature in the HTC One (M8). The fingerprint sensor is available in the iPhone 5s and Galaxy S5. The Samsung scanner even lets you login to PayPal with just a touch of your finger. The processor is by far the most important element in the phone. The ultimate processor to be desired is the Qualcomm Snapdragon. Reach ultimate speeds with the Galaxy Note 3 offering you 3 GB of RAM. Most smartphones have average internal storage space but they let you expand it with a micro SD card. A phone with a higher battery capacity doesn’t always mean that you will enjoy long battery life. The Galaxy S5 and HTC One (M8) have long battery life compared to many other smartphones. These two phones stretch their battery life using the power saving mode feature. A camera is very important in a phone. The Lumia has a 20 MP PureView camera which takes the best quality photos. When it comes to taking selfies the HTC One M8 is the ultimate with the 5 MP front camera. Certainly, to zero-in on a handset one needs to compare between dozens of features, and that times this can be confusing. CompareRaja gives you an insight on and helps you compare mobile features. Your mobile buying blues are instantly sorted. Laptops are no longer only for the business class. Almost everyone wants a portable computer whether it’s a teenager who uses it to complete assignments or a housewife who purchases groceries online. It is especially useful for those who travel often and want to stay in touch with their work and with friends and family. If you are planning on purchasing a laptop, it’s always recommended to buy it online. The main reason being, you need to do a lot of research and comparison before making a purchase and where better than the internet to do just that. You have the liberty to browse through a wide collection of laptops from various brands, check their configuration and select only the best laptop online. You can completely skip the trip to the electronic store and all the hassle associated with it. 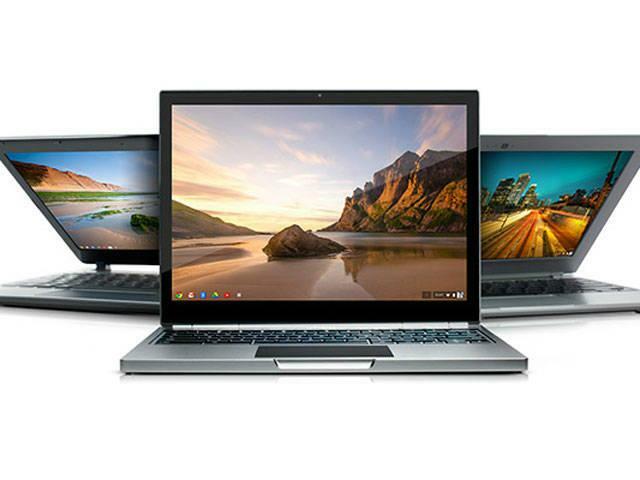 If you were to check the configuration of every laptop in the store, you are sure to be met with impatient staff and even anxious customers who would be waiting for their turn. When you are making a high end purchase and having to take decisions on crucial matters like the configuration of your laptop, you wouldn’t want to be around a pushy sales executive who is constantly upselling absolutely everything. Shopping online allows you to sit back and make decisions in the comfort of your home. Some of the big electronic stores also have their outlets online as they understand this need for a convenient shopping experience. Once you have picked the laptop you want to buy, it is advisable to read reviews about it which is yet another advantage of shopping online. Here you can read up on both positive and negative feedback about the laptop from other users and also check the ratings it received which will enable you to make a much more informed choice. The biggest advantage of purchasing a laptop online is that you can get the most competitive prices online. Online portals offer you warehouse rates which fall much lower than the usual store rates. To top it, the big laptop brands offer you coupon codes which you can redeem and save a lot more when you purchase your new laptop. These coupon codes are only available online on sites like Couponraja.in. Besides that most online portals offer you additional benefits such as free shipping, easy payment options and easy returns. Planning on making a purchase? You might want to check out the amazing offers available with your Snapdeal coupon codes on Couponraja.in. Redeem your Snapdeal coupons for flat Rs. 3000 off on your laptop costing over Rs. 50000. If you are purchasing a laptop costing between Rs. 25000 to Rs. 50000 you can redeem a flat Rs. 1500 off on laptops. For a laptop that cost below Rs. 2500 you can redeem the Snapdeal coupon code and enjoy a flat Rs. 750 off on your new laptop. It would be difficult to find such money and time saving offers anywhere else. Log on now and make a smart shopping decision. If you have any questions that are beyond the scope of this help file, please feel free to email via my user page contact form here. jQuery Responsive Countdown is a tool that gives you the ability to create a nice looking countdown, which uses flipping animation to display remaining time to a target date. Since it is based on the canvas object it cannot run natively in older browsers like IE8. The tool uses SVG data to draw the digits and the panels, so it is scalable and looks nice on larger resolutions too. It does not use images, so it is very easy to change colors and adapt the look of it to the design of your page. 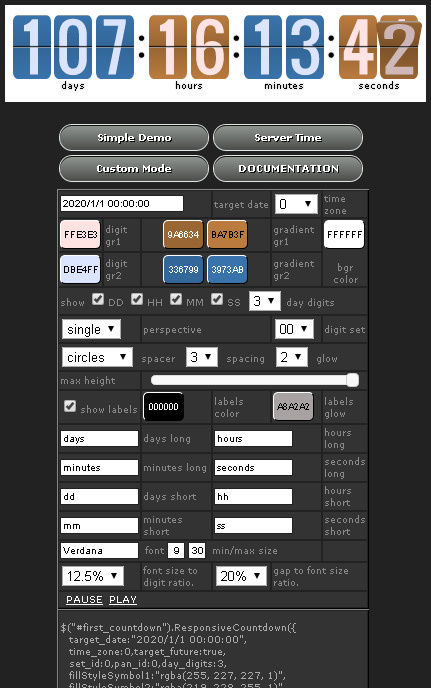 The tool has a large list of options, but it can also be activated with few lines of code. In this tutorial I will show you how to add the tool to a coming soon page. Download the countdown package and unzip it in a folder on your web server. Load the index page, which features the Visual Builder. 1. Using the Visual Builder you will be able to set the colors and all other options that will make your countdown unique. The tool shows the days, hours, minutes and seconds in two types of groups. Group one is used for the most right positioned group – usually that groups is the seconds group and then for every other group (usually hours). The other group is used alternatively. 2. For each group you can set the color of the digits (digit gr1, digit gr2) which is solid color. 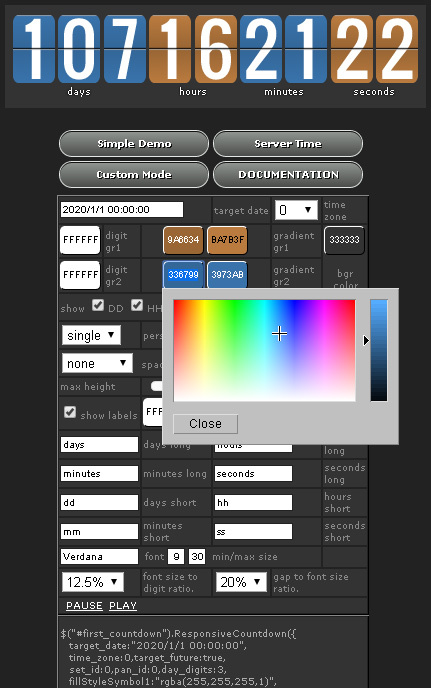 You can also set the color of the panels. Panels can use gradient color (gradient gr1, gradient gr2), or solid color if equal values for each group are entered. The Visual Builder allows the usage of background color, which gives you idea how the countdown will look against the background of your page. Each group can be hidden and number of day digits can be set. Let us imagine that the colors from the image below (fig. 1) are used in your html page design. Using the Visual Builder (fig. 2) the colors of the countdown can changed (fig. 3, fig. 4). 3. Groups can be divided not only by color, but also by space. Normally digits have a bit of space between them, but you can add more between groups (spacing). That option is a number of additional space added to the normal that exists between digits. You can further divide groups by adding a spacer (spacer). It can be circles or squares. The spacer uses the color settings of the labels. Let us use circle dividers and 3x spacing (fig. 5). 4. Since the countdown resizes within the space available it may become very large. You can use the (max height) option to control the maximum size of it. 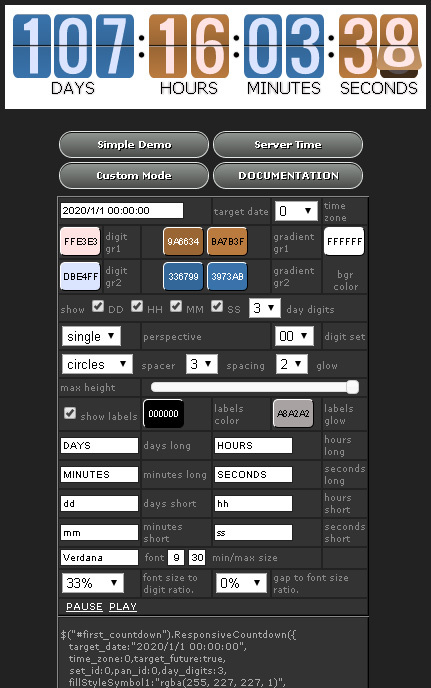 Labels can be hidden (show labels) and their color (labels color) and glow color (labels glow) can be set. Glow color is used to soften the look of the labels, which in some browsers look too pixelated. Glow can be turned off though using the (glow = 0) option. The labels can have long and short caption. Short caption is used when there is not enough space to show the long caption. The labels resize along with digits, but if they reach the minimum size allowed (min size) the short caption is used. Max size can also be controlled for larger resolutions. Use fonts that are web friendly. The font size is calculated based on the size of the digits. So you need to set a percentage value. The gap above the labels that separates them from the digits is again set as a percentage but this time based on the size of the labels. Let for our example use these labels: DAYS, HOURS, MINUTES, SECONDS and set 33% for font size and 0% for gap (fig. 6). Import these in the head section of your page. The tool needs a container to display in. For our example it can be a div element with 100% width. 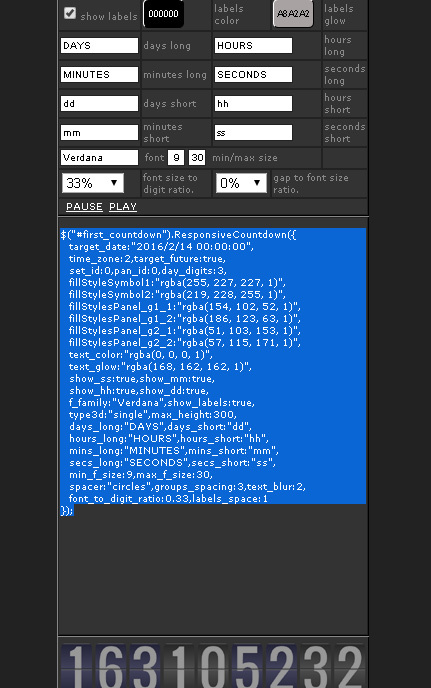 That means the countdown will try to cover all available browser width. Only the maximum height can prevent it from taking all available width for large resolutions. The div needs to have an id, which will be used when the tool is created. Another important setting is the relative position of the div. This is a must because the countdown creates absolutely positioned canvas elements. The countdown can be used to show elapsed time too. It also has a custom mode, where it waits for outside calls that change the states of its digits. The tool has another set of digits. Different sets can be added easily using some SVG descriptions. 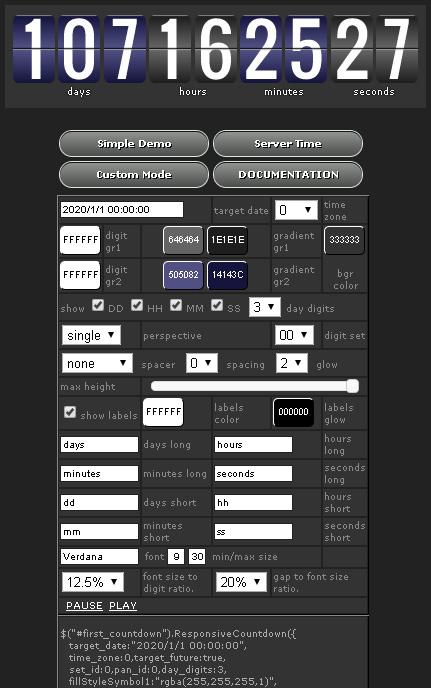 Full documentation is available at jQuery Responsive Countdown Documentation. The tool is available at jQuery Responsive Countdown with Visual Builder. Can You Really Get Work in the Film Industry? How many of us have watched a film and dreamed of playing a part in the film industry? If this applies to you, this article may be of use. Let’s explore how you can find a way into this industry if you are serious about doing so. Some careers are undoubtedly harder to break into than others. One of the toughest must surely be the film industry. It seems as if everyone wants to play their part, whether it is in front of the camera or behind it. But how easy is it to get such a role and is there the potential for a career here? Firstly it is worth bearing in mind that working in this industry is probably considered a more unconventional job. However, if this is what you want to do you should definitely aim for your dream. No job is 100% safe nowadays and if you really have passion for the industry you are more likely to succeed in it than you would if you worked in any other industry. Bear that in mind as you progress and learn more about the opportunities that exist. The good news is you can start researching potential opportunities online. 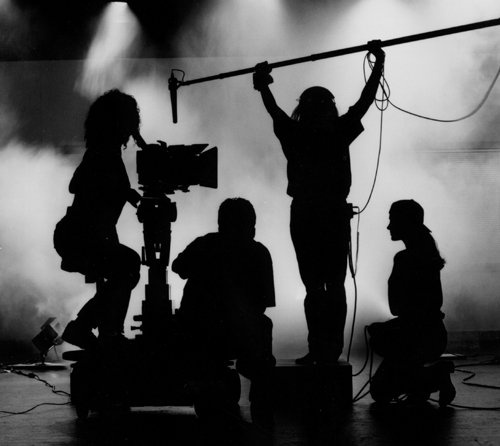 Look for work placements and experience with film production companies – as many as you can find. Persevere as you will probably not strike it lucky on your first attempt. Keep going until you get lucky – and remember that luck often is involved when it comes to getting work (even unpaid work) within the industry. You should be prepared to work for no money to begin with in order to get experience. Once you have your foot in the door you can consider looking for basic entry level jobs with film production companies. These may include positions as runners, who are basically the people who are called upon to do all kinds of menial tasks during the course of a day. Many successful and even famous people in the industry started off like this, so don’t feel you are heading in the wrong direction if you manage to get this position. In fact you could be heading in the right direction. Researching the industry to find out more about it is also a worthy activity. We mentioned the importance of looking online earlier, but it helps to look for more than just job opportunities. The more you understand about the industry the easier it is to make good progress in the future. The more knowledgeable you are the easier it will be to spot opportunities when they occur. You may also find different paths into the industry you may never have known about before. As you can see there is a lot to think about here if you are serious about a career in this industry. Keeping up with the latest opportunities and events is a good way to get ahead, as is the need to keep up your levels of determination. Even if you get knocked back time and time again, it is up to you to make sure you get up and carry on. Who’s to say the 30th time of asking isn’t the one that will finally lead to a successful career in the business? Give it a try and see. Author Nishant AdlakhaPosted on March 27, 2014 Categories OthersLeave a comment on Can You Really Get Work in the Film Industry? If you grew up in the mid 1900s, most of the films you saw or even made yourself will have been recorded on 8mm cine film. In this age of DVDs and mp3 files however, devices to play these old films are rare and anyone hoping to preserve their old film memories should probably look into converting them into a newer format. Think about how you record videos today. While portable video cameras still exist, the hulking behemoths that recorded onto cinefilm have gone the way of the dinosaurs and ultra-sleek smart phones have replaced them. These devices record videos that can be instantly transferred to DVD or stored as a file. Cine film however is largely viewed as a museum piece and playing old reels is time consuming, costly and inconvenient. Furthermore, old cine film may degrade over time, leading to reduced picture quality or even destruction. Old memories stored on the film may be lost forever if forgotten by their owners. There are however, ways to transfer cine film to DVD, ways to recapture your old memories and bring them into the 21st century. There are plenty of companies offering cine film to DVD services but anyone with a film projector can attempt the transfer themselves. One old DIY method uses only a projector and a decent quality recording device. Simply project the cine film onto a flat surface and record the images yourself, ensuring the camera lines up with the projection and doesn’t shake about. 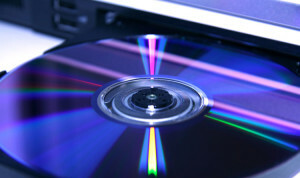 The recording can then be transferred to a computer for editing and then burned onto a DVD, simple! While the quality may not be as crisp and professional looking, it is and easy and cost effective solution almost anyone can use. Those looking for a better quality transfer however might want to consider using a telecine machine. These devices are essentially projectors outfitted with high quality cameras that can provide a much higher quality picture. They provide a much better picture quality but are extremely expensive and so buying or hiring one may be a little to expensive for most. Anyone looking to make use of them should probably approach a specialist but remember to shop around for quotes, especially if you are looking to convert a lot of film. Ultimately, transferring old cine film to DVD isn’t hard and doesn’t have to be expensive. Most companies are affordably priced and may even offer special deals to customers with several video tapes to transfer in this way. Why let old memories fade away when converting them to a digital format really isn’t that hard? If you’re not overly confident about doing it yourself, it can be a good idea to enlist the help of a company that specialises in taking the films of the past and transferring them onto the discs of the present (and future). All you have to do is make a payment and send them your tapes, and they should then send back discs filled with your home movies that can be played on DVD and even Blu-Ray players, though that can be quite expensive. There may not be any improvement on quality, but you can be assured that they’ll last for years to come. There are lots of smart techniques you can use to keep your home or business as safe as it can possibly be. This article looks at some of these methods so you can ensure you deter any would-be burglars who might be thinking about breaking in. 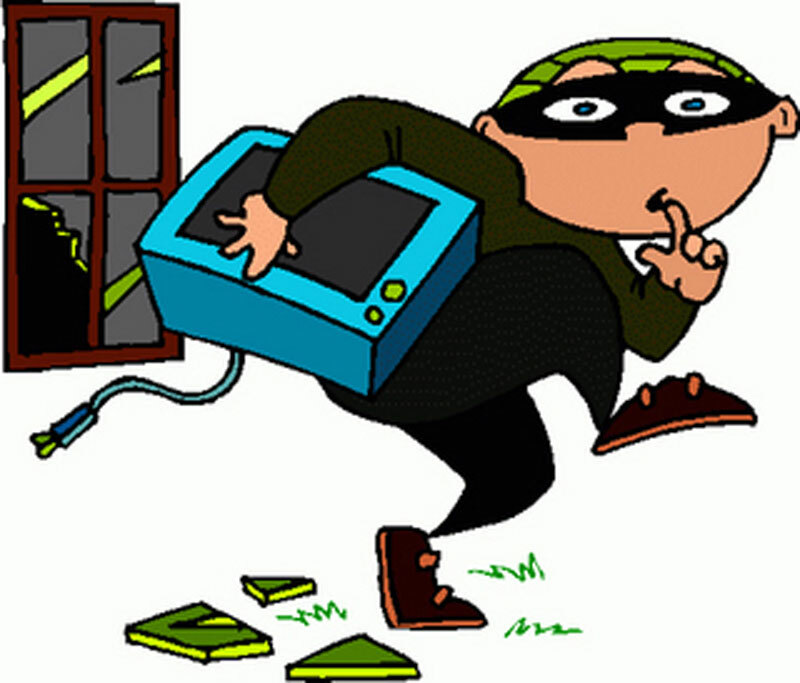 No one likes to think they might be at risk of being burgled. However some people fall victim to this very crime each day. What would you do if you were one of them? Of course the ideal situation is to make sure you minimize the odds of this happening in the first place. Fortunately there are plenty of ways you can do this – you just have to put them into action. The first thing you should do might sound a bit odd. The idea is to look at your property as if you were a burglar. Go outside and look at your home or business objectively. If you wanted to break in, what would the weak spots be? Where would you stand the best chance of getting in? Are there old windows or doors that don’t quite fit properly? Are there areas where a burglar could approach the property and hide from view so they could take their time trying to break in? Don’t just think of the ground floor either – look up and see whether there are any opportunities for someone enterprising and determined to climb and gain access. Just because you can’t or won’t do it doesn’t mean no one else will. Smart solutions are often quite easy to implement too. For example, burglars don’t like to make any noise that might alert someone to what they are trying to do. If you lay a gravel path around your property you will certainly hear if anyone is there. Planting prickly bushes under windows is a good idea too – no one would want to go anywhere near one if they can possibly help it. Another option to consider – especially if you have a business – is to look into perimeter security solutions. These are really ideal for larger businesses as they come in all sizes. Many businesses that offer perimeter security solutions can tailor make something that is just right for your needs. If you need to make sure your business is secure and ready to withstand any kind of attack by an intruder, you need to be ready to invest in the right solution. Hopefully you’re feeling a little better and more pro-active now about the situation. Now is the best time to take every possible step you can to ensure you are able to protect your property. Even something as simple as changing the locks on your doors and windows could prevent a burglary that would otherwise have been easy to carry out. Some of these measures may take a little time and money, but they are all well worth it. Consider what the consequences could be if you don’t do these things and you will see how important they are to take care of. Once you have looked at your home or business from the point of view of a potential burglar, you will see how powerful a can-do attitude can be for you. Protect your property today and it could make a big difference tomorrow.